be sure your voice over will suit your required application perfectly. Our professional mother tongue voice-over artists will re-create your message in any language of your choice. We ensure that every detail is pronounced accurately, with even subtle nuances of the language interpreted to ensure the highest quality reflection of the source material. K International provides a one-stop multilingual voice-over service in over 100 languages. Our voice recording studio in Milton Keynes is fully equipped with the latest equipment and staffed by experienced full time sound engineers. Our professional mother tongue voice-over artists will re-create your message in any language of your choice. We ensure that every detail is pronounced accurately and clearly, with even subtle nuances of the language interpreted to ensure the highest quality reflection of the source material. Our bilingual project managers supervise recording sessions and are available to our clients to work at/with their own choice of voice talent or recording facilities. Trained professionals provide an important second opinion giving you the confidence that your foreign language voice track is delivered with the proper accent, diction and tone. 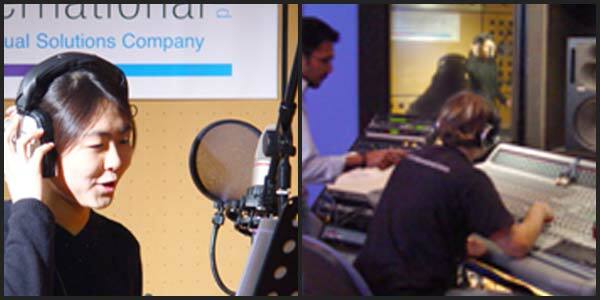 Our fully equipped media studio is capable of producing complex multi-language projects. This case study gives an example of a voice-over project that we produced for the Prison Service in the UK to help the authorities with management of foreign nationals. The styles and techniques demonstrated here can be easily adapted to match your own multilingual voiceover requirements irrespective of the subject matter. The project involved producing the induction programme used within a UK Prison in a format that is understandable by all parties. The induction programme is shown to all new arrivals at any UK Prison. It covers a wide variety of topics such as fire information for prisoners, rules of the prison wing, court appearance procedures, visiting orders, the details of current educational programmes and how to report racist incidents, harassment, or discrimination. The subjects covered in the programme can make an important difference to the lives of the prisoners and the smooth running of the prison, so it is vital that this information is understood by all. Illiteracy is common within the prison population with almost 50% of prisoners not being able to read, so any printed material has to be explained. This adds considerable costs in cases of foreign nationals as prisons have to bring in people to explain the induction process face-to-face and again later on in the process when procedures have to be re-explained. After consultation with K International the following solution was developed and installed. K International suggested that the induction programme should be supplied in an audio format that could be played (as many times as needed) to the prisoners. This would be made available in all languages that are spoken by inmates within the prison. The process to achieve this was as follows. Prepare the script. Working closely with the prison we prepared an English script that included all of the relevant information needed in the induction programme. After several rounds of amendments this was agreed upon and sent for translation. Translate the script. The script was translated into 10 languages. It is important that the script is translated and carefully prepared for the voiceover artists as they are not translators. Record the voice. We hosted the recording sessions for the Albanian, Arabic, Chinese, English, French, Italian, Polish, Portuguese, Punjabi, Russian and Spanish voice-overs. Sessions took almost 10 days of studio time to record. The picture below left is of our studio in action on this project. Test. After editing each of these recordings were checked by the vocal artist and an independent language speaker for linguistic completeness and to ensure they were fit for use. Distribute. We can distribute recordings in all of the leading formats including, CD, DVD, Wav, podcast and tape. In this instance CDs were produced (including artwork for the case) and 50 copies sent to the prison. The client was delighted. They found that the audio recordings of the induction material are better understood and save money every month on telephone and face-to-face interpreting costs. Following an audit by the Inspector of Prisons this process has now been highlighted as best practice and will be rolled out to the whole of the Prison Service.